This class defines shared system methods/attributes for 2D moment features but no functional code. It is used to compute interaction matrices for moment features. While vpMoment-type classes do only compute moment values and can by used for almost anything, vpFeatureMoment-type classes are specifically designed for visual servoing. More importantly, a vpFeatureMoment is used to compute the interaction matrix associated to it's moment primitive. Plane orientation parameters (A,B,C): Each camera frame corresponds to a physical planar object contained in a plane. This plane's equation has the following form: . These parameters can be updated anytime. Get corresponding moment primitive: for example a vpFeatureMomentCInvariant will provide access to a vpMomentCInvariant instance. Provide access to a feature database (vpFeatureMomentDatabase). All interaction matrices (different from vpBasicFeature::interaction which selects the required interaction matrix). Like vpMoment, vpFeatureMoment provides a vpFeatureMoment::update() method. But unlike vpMoment::update() which only acknowledges the new object, the vpFeatureMoment::update() acknowledges the new plane parameters AND computes the interaction matrices associated with the feature. A vpFeatureMoment will be often part of a vpFeatureMomentDatabase in the same way a vpMoment is part of a vpMomentDatabase. This database is specified inside the vpFeatureMoment::vpFeatureMoment() constructor. As a result, a vpFeatureMoment will be able to access other vpFeatureMoments through this database. A vpBasicFeature can be duplicated into a vpMomentGenericFeature. In that case, all data in the vpBasicFeature is copied but the feature's name is lost. For example if a vpFeatureMomentCInvariant is duplicated, the duplicata will be operational but could not be used in a vpFeatureMomentDatabase. Note that you can use vpFeatureMoment to do visual servoing but it is not it's only purpose. You may compute your interaction matrices with vpFeatureMoment::update() and use them for any purpose. - A vpFeatureMoment is not responsible for updating the moment primitives it depends on. Make sure your vpMoments are all up to date before computing an interaction matrix using vpFeatureMoment. - Be careful with orders. Often, computing a feature of order n requires vpMoment primitives of order n+1. Make sure to check the documentation of the specialised vpFeatureMoment classes when deciding to which order you want to initialize the object. An object of order 6 should be sufficient for all classic implementations of vpFeatureMoment. Here is an example of how to use a vpFeatureMoment (in this case vpFeatureMomentBasic). //only contain the basic moment. Definition at line 159 of file vpFeatureMoment.h. Initializes the feature with information about the database of moment primitives, the object plane, feature database and matrix size. nbmatrices : If you want to create a new vpFeatureMoment implementation, your feature will often have a matrix size of n lines. You can specify the number of lines by this parameter. Definition at line 204 of file vpFeatureMoment.h. References vpBasicFeature::display(), vpBasicFeature::duplicate(), vpBasicFeature::getDimension(), vpColor::green, vpBasicFeature::init(), vpBasicFeature::interaction(), and vpBasicFeature::print(). Definition at line 258 of file vpFeatureMoment.cpp. 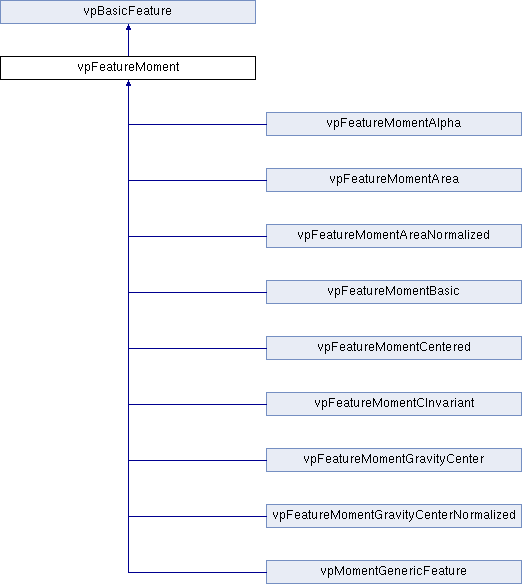 Reimplemented in vpFeatureMomentGravityCenterNormalized, vpFeatureMomentCInvariant, vpFeatureMomentGravityCenter, vpFeatureMomentAreaNormalized, vpFeatureMomentAlpha, vpFeatureMomentCentered, vpFeatureMomentBasic, and vpFeatureMomentArea. Definition at line 256 of file vpFeatureMoment.cpp. Referenced by update(), vpFeatureMomentAlpha::vpFeatureMomentAlpha(), vpFeatureMomentArea::vpFeatureMomentArea(), vpFeatureMomentAreaNormalized::vpFeatureMomentAreaNormalized(), vpFeatureMomentCInvariant::vpFeatureMomentCInvariant(), vpFeatureMomentGravityCenter::vpFeatureMomentGravityCenter(), and vpFeatureMomentGravityCenterNormalized::vpFeatureMomentGravityCenterNormalized(). References A, B, C, vpBasicFeature::dim_s, featureMomentsDataBase, vpBasicFeature::flags, interaction_matrices, moment, moments, vpBasicFeature::nbParameters, vpColVector::resize(), and vpBasicFeature::s.
References vpBasicFeature::dim_s, vpBasicFeature::flags, vpMoment::get(), moment, vpBasicFeature::nbParameters, vpColVector::resize(), and vpBasicFeature::s.
References vpBasicFeature::dim_s, vpBasicFeature::FEATURE_LINE, interaction_matrices, and vpMatrix::stack(). References _name, featureMomentsDataBase, vpException::memoryAllocationError, and name(). Name of the moment corresponding to the feature. This allows to locate the moment associated with the feature in the provided database. Implemented in vpMomentGenericFeature, vpFeatureMomentGravityCenterNormalized, vpFeatureMomentCInvariant, vpFeatureMomentGravityCenter, vpFeatureMomentAreaNormalized, vpFeatureMomentAlpha, vpFeatureMomentCentered, vpFeatureMomentBasic, and vpFeatureMomentArea. Name of the feature used to locate it in the database of features. References A, B, C, compute_interaction(), vpBasicFeature::dim_s, vpBasicFeature::flags, vpMomentDatabase::get(), vpMoment::get(), moment, momentName(), moments, vpBasicFeature::nbParameters, vpException::notInitialized, vpColVector::resize(), and vpBasicFeature::s.
Definition at line 260 of file vpFeatureMoment.cpp. Referenced by vpFeatureMomentCentered::name(), and vpFeatureMomentCInvariant::selectPy(). Referenced by vpFeatureMomentArea::compute_interaction(), vpFeatureMomentBasic::compute_interaction(), vpFeatureMomentCentered::compute_interaction(), vpFeatureMomentAlpha::compute_interaction(), vpFeatureMomentAreaNormalized::compute_interaction(), vpFeatureMomentGravityCenter::compute_interaction(), vpFeatureMomentGravityCenterNormalized::compute_interaction(), duplicate(), and update(). Referenced by vpFeatureMomentArea::compute_interaction(), vpFeatureMomentBasic::compute_interaction(), vpFeatureMomentCentered::compute_interaction(), vpFeatureMomentAreaNormalized::compute_interaction(), vpFeatureMomentGravityCenter::compute_interaction(), vpFeatureMomentGravityCenterNormalized::compute_interaction(), duplicate(), and update(). Referenced by vpGenericFeature::duplicate(), duplicate(), vpFeatureLuminance::error(), vpBasicFeature::error(), vpGenericFeature::error(), vpBasicFeature::get_s(), vpGenericFeature::get_s(), vpBasicFeature::getDimension(), getDimension(), vpFeatureVanishingPoint::init(), vpFeatureEllipse::init(), vpFeatureLuminance::init(), vpFeatureSegment::init(), vpFeatureDepth::init(), vpFeaturePoint::init(), init(), vpFeatureLine::init(), vpFeaturePoint3D::init(), vpFeatureThetaU::init(), vpFeaturePointPolar::init(), vpFeatureTranslation::init(), vpFeatureLuminance::interaction(), vpGenericFeature::interaction(), interaction(), vpFeatureLuminance::operator=(), vpBasicFeature::operator=(), vpGenericFeature::print(), print(), vpGenericFeature::set_s(), vpGenericFeature::setError(), vpGenericFeature::setInteractionMatrix(), update(), vpFeatureLuminance::vpFeatureLuminance(), and vpGenericFeature::vpGenericFeature(). Referenced by vpBasicFeature::error(), vpGenericFeature::error(), vpBasicFeature::get_s(), vpBasicFeature::getDimension(), getDimension(), vpGenericFeature::interaction(), interaction(), vpGenericFeature::print(), print(), vpFeatureSegment::selectAlpha(), vpFeatureSegment::selectL(), vpFeatureEllipse::selectMu02(), vpFeatureEllipse::selectMu11(), vpFeatureEllipse::selectMu20(), vpFeatureLine::selectRho(), vpFeaturePointPolar::selectRho(), vpFeatureLine::selectTheta(), vpFeaturePointPolar::selectTheta(), vpFeatureThetaU::selectTUx(), vpFeatureThetaU::selectTUy(), vpFeatureThetaU::selectTUz(), vpFeatureTranslation::selectTx(), vpFeatureTranslation::selectTy(), vpFeatureTranslation::selectTz(), vpFeatureVanishingPoint::selectX(), vpFeatureEllipse::selectX(), vpFeaturePoint::selectX(), vpFeaturePoint3D::selectX(), vpFeatureSegment::selectXc(), vpFeatureVanishingPoint::selectY(), vpFeatureEllipse::selectY(), vpFeaturePoint::selectY(), vpFeaturePoint3D::selectY(), vpFeatureSegment::selectYc(), and vpFeaturePoint3D::selectZ(). Referenced by vpFeatureMomentCentered::compute_interaction(), vpFeatureMomentCInvariant::compute_interaction(), duplicate(), and linkTo(). Referenced by vpFeatureEllipse::buildFrom(), vpFeatureVanishingPoint::buildFrom(), vpFeatureDepth::buildFrom(), vpFeaturePoint::buildFrom(), vpFeatureLine::buildFrom(), vpFeaturePoint3D::buildFrom(), vpFeatureThetaU::buildFrom(), vpFeaturePointPolar::buildFrom(), vpFeatureTranslation::buildFrom(), duplicate(), vpFeatureVanishingPoint::init(), vpFeatureEllipse::init(), vpFeatureLuminance::init(), vpFeatureSegment::init(), vpFeatureDepth::init(), vpFeaturePoint::init(), init(), vpFeatureLine::init(), vpFeaturePoint3D::init(), vpFeatureThetaU::init(), vpFeaturePointPolar::init(), vpFeatureTranslation::init(), vpFeatureVanishingPoint::interaction(), vpFeatureEllipse::interaction(), vpFeatureSegment::interaction(), vpFeatureDepth::interaction(), vpFeaturePoint::interaction(), vpFeatureLine::interaction(), vpFeaturePoint3D::interaction(), vpFeatureThetaU::interaction(), vpFeaturePointPolar::interaction(), vpFeatureTranslation::interaction(), vpBasicFeature::operator=(), vpBasicFeature::resetFlags(), vpFeaturePointPolar::set_rho(), vpFeaturePointPolar::set_rhoThetaZ(), vpFeaturePointPolar::set_theta(), vpFeatureThetaU::set_TUx(), vpFeatureThetaU::set_TUy(), vpFeatureThetaU::set_TUz(), vpFeatureVanishingPoint::set_x(), vpFeatureEllipse::set_x(), vpFeatureDepth::set_x(), vpFeaturePoint::set_x(), vpFeaturePoint3D::set_X(), vpFeatureEllipse::set_xy(), vpFeaturePoint::set_xyZ(), vpFeaturePoint3D::set_XYZ(), vpFeatureDepth::set_xyZLogZoverZstar(), vpFeatureEllipse::set_y(), vpFeatureVanishingPoint::set_y(), vpFeatureDepth::set_y(), vpFeaturePoint::set_y(), vpFeaturePoint3D::set_Y(), vpFeatureLuminance::set_Z(), vpFeatureDepth::set_Z(), vpFeaturePoint::set_Z(), vpFeaturePoint3D::set_Z(), vpFeaturePointPolar::set_Z(), vpFeatureEllipse::setABC(), vpFeatureLine::setABCD(), vpBasicFeature::setFlags(), vpFeatureEllipse::setMu(), vpFeatureLine::setRhoTheta(), update(), vpFeatureLuminance::vpFeatureLuminance(), and vpBasicFeature::~vpBasicFeature(). Referenced by vpFeatureMomentArea::compute_interaction(), vpFeatureMomentBasic::compute_interaction(), vpFeatureMomentCentered::compute_interaction(), vpFeatureMomentAlpha::compute_interaction(), vpFeatureMomentAreaNormalized::compute_interaction(), vpFeatureMomentGravityCenter::compute_interaction(), vpFeatureMomentCInvariant::compute_interaction(), vpFeatureMomentGravityCenterNormalized::compute_interaction(), duplicate(), vpFeatureMomentBasic::interaction(), vpFeatureMomentCentered::interaction(), and interaction(). Referenced by vpFeatureMomentArea::compute_interaction(), vpFeatureMomentBasic::compute_interaction(), vpFeatureMomentCentered::compute_interaction(), vpFeatureMomentAlpha::compute_interaction(), vpFeatureMomentAreaNormalized::compute_interaction(), vpFeatureMomentGravityCenter::compute_interaction(), vpFeatureMomentCInvariant::compute_interaction(), vpFeatureMomentGravityCenterNormalized::compute_interaction(), duplicate(), init(), vpFeatureMomentBasic::interaction(), vpFeatureMomentCentered::interaction(), and update(). Referenced by vpFeatureMomentArea::compute_interaction(), vpFeatureMomentCentered::compute_interaction(), vpFeatureMomentAlpha::compute_interaction(), vpFeatureMomentAreaNormalized::compute_interaction(), vpFeatureMomentGravityCenter::compute_interaction(), vpFeatureMomentCInvariant::compute_interaction(), vpFeatureMomentGravityCenterNormalized::compute_interaction(), duplicate(), and update(). Referenced by vpFeatureVanishingPoint::buildFrom(), vpFeatureEllipse::buildFrom(), vpFeatureDepth::buildFrom(), vpFeaturePoint::buildFrom(), vpFeatureLine::buildFrom(), vpFeaturePoint3D::buildFrom(), vpFeatureThetaU::buildFrom(), vpFeaturePointPolar::buildFrom(), duplicate(), vpFeatureVanishingPoint::init(), vpFeatureEllipse::init(), vpFeatureLuminance::init(), vpFeatureSegment::init(), vpFeatureDepth::init(), vpFeaturePoint::init(), init(), vpFeatureLine::init(), vpFeaturePoint3D::init(), vpFeatureThetaU::init(), vpFeaturePointPolar::init(), vpFeatureTranslation::init(), vpFeatureVanishingPoint::interaction(), vpFeatureEllipse::interaction(), vpFeatureSegment::interaction(), vpFeatureDepth::interaction(), vpFeaturePoint::interaction(), vpFeatureLine::interaction(), vpFeaturePoint3D::interaction(), vpFeatureThetaU::interaction(), vpFeaturePointPolar::interaction(), vpFeatureTranslation::interaction(), vpBasicFeature::operator=(), vpBasicFeature::resetFlags(), vpFeaturePointPolar::set_rhoThetaZ(), vpFeaturePoint::set_xyZ(), vpFeaturePoint3D::set_XYZ(), vpFeatureDepth::set_xyZLogZoverZstar(), vpFeatureEllipse::setABC(), vpFeatureLine::setABCD(), vpBasicFeature::setFlags(), update(), and vpFeatureLuminance::vpFeatureLuminance(). Referenced by vpFeatureEllipse::buildFrom(), vpFeatureVanishingPoint::buildFrom(), vpFeatureLuminance::buildFrom(), vpFeatureDepth::buildFrom(), vpFeaturePoint::buildFrom(), vpFeatureLine::buildFrom(), vpFeaturePoint3D::buildFrom(), vpFeatureThetaU::buildFrom(), vpFeaturePointPolar::buildFrom(), vpFeatureTranslation::buildFrom(), vpFeatureEllipse::display(), duplicate(), vpFeatureVanishingPoint::error(), vpFeatureEllipse::error(), vpFeatureLuminance::error(), vpBasicFeature::error(), vpFeatureDepth::error(), vpFeatureMomentAlpha::error(), vpGenericFeature::error(), vpFeaturePoint::error(), vpFeatureLine::error(), vpFeaturePoint3D::error(), vpFeatureThetaU::error(), vpFeaturePointPolar::error(), vpFeatureTranslation::error(), vpFeatureDepth::get_LogZoverZstar(), vpFeaturePointPolar::get_rho(), vpBasicFeature::get_s(), vpGenericFeature::get_s(), vpFeaturePointPolar::get_theta(), vpFeatureThetaU::get_TUx(), vpFeatureThetaU::get_TUy(), vpFeatureThetaU::get_TUz(), vpFeatureTranslation::get_Tx(), vpFeatureTranslation::get_Ty(), vpFeatureTranslation::get_Tz(), vpFeatureVanishingPoint::get_x(), vpFeaturePoint::get_x(), vpFeaturePoint3D::get_X(), vpFeatureVanishingPoint::get_y(), vpFeaturePoint::get_y(), vpFeaturePoint3D::get_Y(), vpFeaturePoint3D::get_Z(), vpBasicFeature::getDimension(), vpFeatureVanishingPoint::init(), vpFeatureEllipse::init(), vpFeatureLuminance::init(), vpFeatureSegment::init(), vpFeatureDepth::init(), vpGenericFeature::init(), vpFeaturePoint::init(), init(), vpFeatureLine::init(), vpFeaturePoint3D::init(), vpFeatureThetaU::init(), vpFeaturePointPolar::init(), vpFeatureTranslation::init(), vpFeatureEllipse::interaction(), vpFeatureLine::interaction(), vpFeatureThetaU::interaction(), vpFeatureTranslation::interaction(), vpBasicFeature::operator=(), vpFeatureEllipse::print(), vpFeatureSegment::print(), vpGenericFeature::print(), print(), vpFeatureLine::print(), vpFeatureThetaU::print(), vpFeatureTranslation::print(), vpFeatureDepth::set_LogZoverZstar(), vpFeaturePointPolar::set_rho(), vpGenericFeature::set_s(), vpFeaturePointPolar::set_theta(), vpFeatureThetaU::set_TUx(), vpFeatureThetaU::set_TUy(), vpFeatureThetaU::set_TUz(), vpFeatureTranslation::set_Tx(), vpFeatureTranslation::set_Ty(), vpFeatureTranslation::set_Tz(), vpFeatureVanishingPoint::set_x(), vpFeatureEllipse::set_x(), vpFeaturePoint::set_x(), vpFeaturePoint3D::set_X(), vpFeatureEllipse::set_xy(), vpFeatureEllipse::set_y(), vpFeatureVanishingPoint::set_y(), vpFeaturePoint::set_y(), vpFeaturePoint3D::set_Y(), vpFeaturePoint3D::set_Z(), vpFeatureEllipse::setMu(), vpFeatureLine::setRhoTheta(), update(), and vpGenericFeature::vpGenericFeature().